One of the phenomenons interesting to us at Nightwatch Paranormal is the Black dog or hell hound phenomenon. They are often refered to as spectral canines as well. This page will serve as an overview. 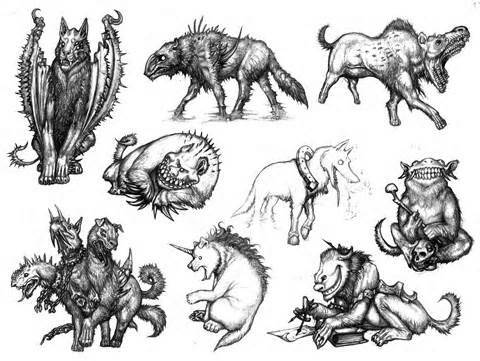 There is way too much lore and legend surrounding these beasts to contain all of it in a single page so we'll just give you a small taste here. To the left we will be linking specific hounds of legend on thier own pages. The Black Dogs of lore are a varied bunch. They seem to center around the U.K. although there have been sightings across the pond in the U.S. and throughout Latin America. Some appear to be ghost like, others appear solid. They are not easy to mistake as a normal pet as they often appear larger than a normal dog with red eyes. The beast’s teeth are much larger than any dog’s teeth. There is a sulfuric scent often noted during one’s encounter with the Black Dogs. Occasionally, the dog is headless but is heard to howl eerily. Its paws can sometimes be heard hitting the ground. Other times, the dog is silent as a tomb. Black dogs are often sighted in graveyards, and gallows sites, as well as roads and bridges. Often after the huge dog has been sighted, something terrible happens to the person, or family of the person, who has encountered the demon dog. The Scottish Moddey Dhoo, the Irish Cu Sith are both examples of this. The Scottish also have a tradition of Black dogs guarding ancient treasures. The Native Americans have several legends that include black dogs and black ghost dogs being present when a catastrophe is on the horizon. There is also a shamanic belief that the dogs guard the land of the underworld. An example of the hound as an omen is from Sir Conan Doyle’s telling of the “Hound of Baskerville” where a generational curse upon a family is thwarted by Sherlock Holmes. church door. It appears even holy ground may not be safe from these creatures. The black dog has been seen for hundreds of years in the eastern coastal region of England, and goes my a large variety of names and descriptions. In some areas it goes by “Black Shuck,” other areas call the hound “Doom Dog,” “Barghest,” “Hell Hound of Norfolk,” “Old Snarleyow,” “Mauthe Dhoog,” and “Old Scarfe.” Each area has it’s own distinct hound. All are very similar in many aspects, but they do differ slightly in certain ways small ways depending on which village you are passing through. Of course , links between human and Canine go much further back. The dog is said to be the first domesticated animal. Dogs were closely linked with the Greek goddess Hecate. Her pet was the dog Cerberus (or Kerberos) who is the watchdog at the entrance to Hades. The hounds also appeared in Celtic mythology as part of the Wild Hunt. Central Europe. Although the details of the hunt vary from local to local the basic premise in all instances is the same. During the night a phantasmal group of huntsmen tear around in mad pursuit of their prey. They are usually on horse with packs of hounds and many huntsmen. They are often seen in the sky, sometimes just off the ground or actually on the ground. 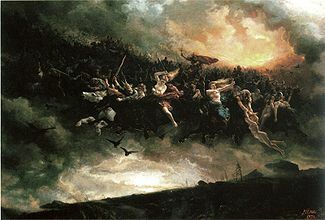 Motives for the hunt also vary from place to place as it is often seen as a prelude to catastrophe such as war or plague. Often it was thought that it would bring death to the one who witnessed it. It was thought the mortals who were in it’s path could be swept up and become, for a period of time, part of the hunt.